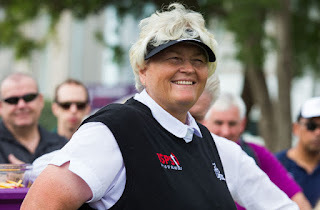 European captain Catriona Matthew has completed her backroom staff by naming Dame Laura Davies as a vice-Captain for The 2019 Solheim Cup at The Gleneagles Hotel in Perthshire, Scotland, on September 13-15. Davies brings a wealth of experience to the European team, as both the event’s leading points scorer, with 25, and as the player with the most appearances, 12. She will join Suzann Pettersen and Kathryn Imrie, the three vice captains having made a combined 21 Solheim Cup appearances over a 25-year spell from 1990 to 2015, amassing a total of 45 ½ points for Europe. “She played in the first 12, won 87 times, has a wealth of experience, is still playing, knows all the players, will be great fun in the team room… I mean, it was really a no brainer!” said Matthew. Matthew was initially unsure whether Davies would accept the vice captaincy role, as the four-time Major champion has declared that she never wants to be Solheim Cup captain, but she could not have been keener. Speaking ahead of her appearance this week in Spain, Davies said: “I’m delighted and honoured to have been asked to be a vice captain for the first time by Catriona. She sent me a text message when I was doing commentary at The Ryder Cup and I thought, ‘Ah, I wonder what this will be about.’ Sure enough, she asked me if I would do it and I didn’t even have to think about it. I want to be part of the team and I hope that I can make a positive contribution and help in any way that I can. “The Solheim Cup has always held a very special place in my heart, right from the first one in 1990. Many of my fondest memories have been made during The Solheim Cup and I’m hoping that this one, at Gleneagles, will be the best yet. Davies’ individual golfing accomplishments on the global stage include 87 tournament wins, including 45 Ladies European Tour titles and 20 LPGA titles. She has also won on the LPGA of Japan, the Australian Ladies Professional Golf Tour, the Ladies Asian Golf Tour and recently completed a clean sweep of majors on the Legends Tour, with her win at the inaugural U.S. Senior Women’s Open conducted by the USGA in July followed by the Senior LPGA Championship presented by Old National Bank in October. In addition to her tournament victories, Davies has won a record seven Ladies European Tour Order of Merit titles. She was the first non-American to finish at the top of the LPGA money list and is a member of the World Golf Hall of Fame. Davies has featured in four victorious Solheim Cup teams, in 1992, 2000, 2003 and 2011, winning 25 points from her 46 matches from 1990-2011. She worked as a television commentator for Sky Sports during the 2013, 2015 and 2017 matches. At The 2019 Solheim Cup, the 16th staging of the contest, Europe will look to regain the trophy for the first time in six years, following the last win in Colorado. The United States team has won the last two competitions in St. Leon-Rot, Germany and Des Moines, Iowa and will be looking to make it three in a row in Scotland. “Dame Laura is unquestionably a legend of the game and will bring unrivalled experience and insight, helping Catriona inspire the European team. Make sure you don’t miss the opportunity to be there to enjoy the action and witness sporting history being made in a truly unique setting. Tickets are on sale now at www.solheimcup2019.com.